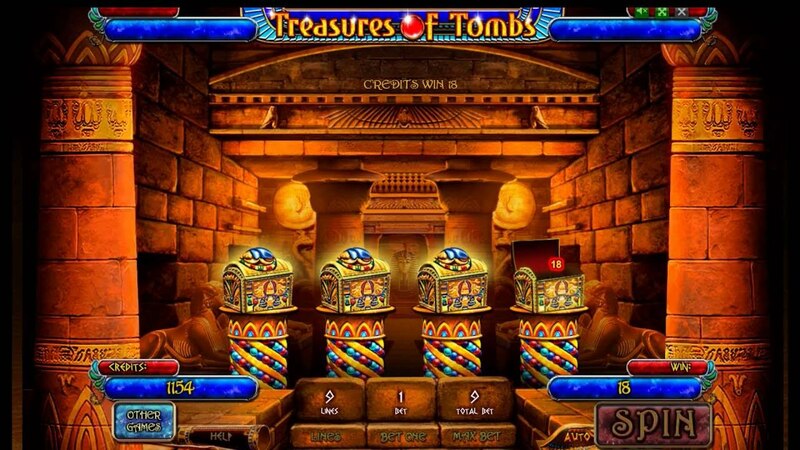 Treasure of Tombs adds to the long list of Egyptian themed slots online that could be argued to be saturating the online slot market. However, this game is different. 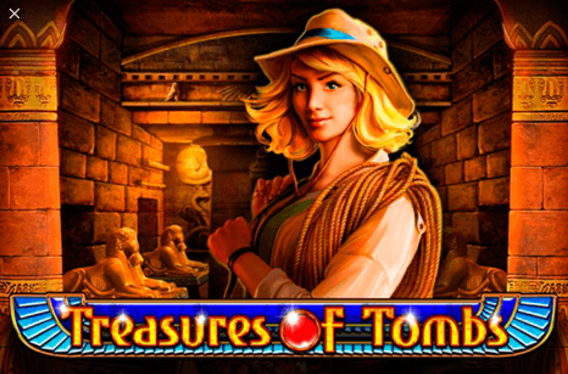 Treasure of Tombs offers a contemporary take on the genre with a female protagonist and an array of intriguing symbols that will have you depositing more and more upon every win. The developers are Playson are some of the most inventive in the online casino industry, creating unique and exciting slots experiences with some of the most interesting themes and fun gameplays. There’s nothing stopping them from offering players the best and most profitable games, in order to satisfy their wallets and convince them to come back. You can find our more about Playson's range of games here. Treasures of Tombs takes you to Ancient Egypt, the time of pharaohs and their powerful reigns. There are many treasures to be discovered in their tombs and you have the chance to go on this Egyptian adventure. What are you waiting for? Golden artefacts, precious gems, objects old as time, these are only some of the things that are hidden away inside the graves of great pharaohs. The mystery of their lives and deaths and all the wonderful treasures they left behind, untouched until now, should be enough to entertain you on this journey through sand dunes and pyramids. With some luck, the mummies won’t be cursed and you can calmly explore all the wonders of this ancient civilization. 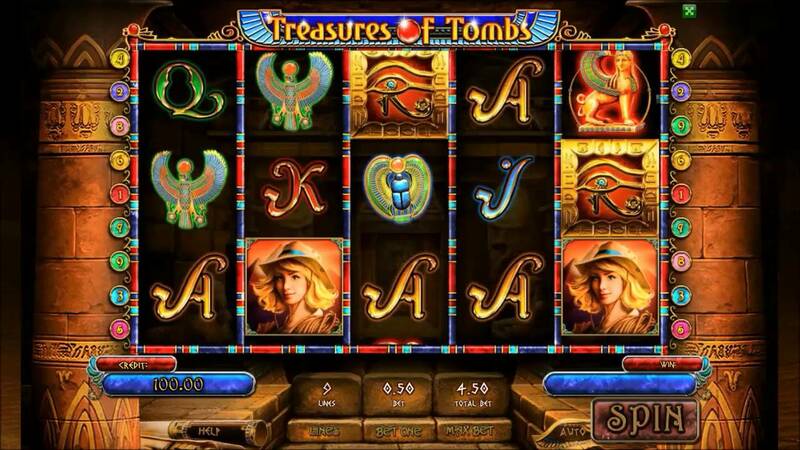 Treasure of Tombs has 5 reels and 9 paylines filled with Egyptian charm and secrets. The background is really designed like a tomb, and the music really engulfs you into the proper ancient atmosphere. You can bet starting from 0.27 credits, with a maximum bet of 45 credits. You can also select the auto-play option and just watch how you start winning. There’s a lot of thrill in mysteries and secrets, especially since Treasure of Tombs has a bunch of extra features you can play around with. The letter symbols resemble hieroglyphs written in vibrant colours and there’re also beautiful artefacts present on the reels. The graphics really take advantage of the theme and explore the beauty of Egypt. The Wild Card of the game is the Egyptian Eye symbol, and it substitutes any other symbol, in order to form more winning combinations. The Wild wins are also paid independently of the bet lines. When you spin 3 or more eye symbols, the Bonus Game is triggered. Then, you are given the opportunity to choose items and uncover prizes that lie within. The prizes range between 225 credits and 1,350 credits. However, if you choose an item that is empty, the Bonus Game ends. Furthermore, there’s a Super Bonus Game that triggers once you uncovered all the prizes in the initial Bonus Game. Then, you are presented with two vases from which you have to choose. There’s no possibility of losing here, since one of the vases is worth 3 375 credits, while the other is worth 6,750 credits. Treasures of Tombs is a profitable trip to ancient Egypt that you won’t regret in the slightest, because of the exciting gameplay full of fun features, the beautiful graphics that fully exploit the unique theme, and the possible wins, which can’t be ignored. If you’ve ever fancied yourself an explorer or solver of mysteries, now is your chance to put your skills to great use and be rewarded. If you enjoyed the Treasures of Tombs you might also like Bees Kneez online slots game. To go back to our homepage, Click here!